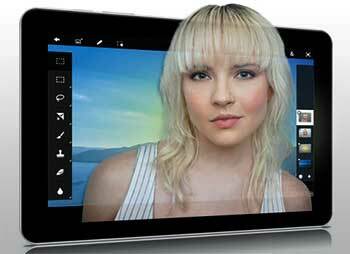 Adobe has just announced the new Adobe® Photoshop® Touch for Android Tablets. John Nack has posted about it on his blog: Introducing Photoshop Touch including a video from him, and one from Russell Brown introducing the new features of Photoshop Touch in a short, 10 min tour. Adobe’s Mobile & Tablet Apps page : What is Adobe Photoshop Touch? Creative compositing meets multitouch fun in Adobe® Photoshop® Touch for Android tablets. Combine multiple images, edit specific elements, and apply filters and other effects—and get great guidance from interactive tutorials. Share your creations to Facebook and view comments right within the app. Sync your files with Adobe Creative Cloud so they’re easy to open in Photoshop for further editing. John Nack says Photoshop Touch will be available for $9.99, and in a rare ‘Android first’ move, it will be available for iOS soon, too.